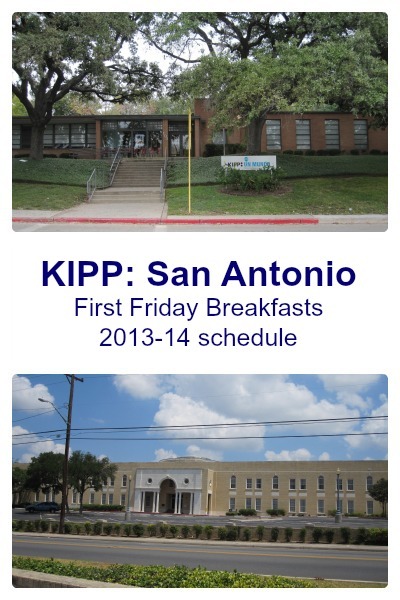 The First Friday breakfast location rotates among the four KIPP: San Antonio campuses; if you are a regular visitor, you will get to see all the campuses in town. KIPP: San Antonio is a Choose to Succeed partner. With local philanthropic support, KIPP: San Antonio is planning to open another elementary school, KIPP Esperanza, in Fall 2014. Posts about previous First Friday Breakfasts: March 2013, December 2012, and May 2012. What else is going on in the KIPP-verse? KIPP School Summit 2013 just wrapped up in Las Vegas (#KSS2013 on Twitter).